Cape Panwa, Phuket "There is a place on the Southeastern tip of Phuket Island which is known as Cape Panwa. 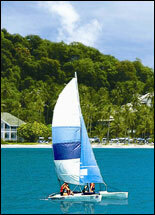 There is a resort with a white sandy beach and tall coconut trees and it is known as the Cape Panwa Hotel. Come to Phuket Island and stay at the Cape Panwa Hotel. You'll surely find out why this secret hideaway is so famous. We think we are one of the best, naturally." All rooms, Villas and Suites are facing the Andaman sea. The 246 rooms are contained in a selection of low rise one to four storey buildings, surrounded by the oasis of a coconut grove and verdant tropical gardens. A world of culinary delights catering specially for all your needs with a selection of five restaurants and five bars - be it Thai, French, Italian, Sea Food, Continental or Asian cuisine. Refreshing cocktails, connoisseur wines and liqueurs are featured in air-conditioned or tropical open air bars. No holiday is ever complete without that irresistible mouth watering food and the Cape Panwa Hotel has a world of culinary delights catering specially for all your needs. A casual open air restaurant near the swimming pool. The hotel's main restaurant serves daily breakfast buffet, international and local specialties and several theme buffets. A magnificent Sino- Portuguese style mansion near the beach. Offer authentic Thai cuisine and traditional live Thai music. On the ground floor at the end of building E. An elegant and cosy grill room on the hill overlooking the Andaman Sea. Serves international and seafood specialties with a tropical Phuket influence. Opening hours : 18:30 - 23:00 h.
A cosy and friendly Italian restaurant serving all the classics from the Italian cuisine. A unique pub with a genuine nautical atmosphere, dart board and other pub games. Daily live band or taped music. Located near the main entrance across the car park. Opening hours : 17:00 - 01:00 h.
An out door terrace and bar by the seafront. Specializes in fresh seafood B.B.Q. and is popular with the local islanders. Piano bar and lounge with daily entertainment located next to the Top of the Reef restaurant. Offers a wide range of exotic cocktails and drinks. Open bar and seating corner offering cool drinks, delicious B.B.Q. and snacks on the beach near the Andaman Sea. A wide range of sandwiches and ice cream are also available. Opening hours : 9:00 - 18:00 h.
A casual European snack bar and terrace offering popular local Thai food prepared in front of your table. Opening hours : Snack bar 10:00 - 23:00, Terrace 17:00 - 23:00 h.
A cosy bar and lounge next to the Uncle Nan's restaurant. The ideal venue for pre-dinner cocktails and drinks. You can find most things needed for a good holiday at the Cape Panwa Hotel. Tennis court, fitness centre, sauna, massage, swimming pool with adjacent children's pool, beachside pool, water sports, daily boat service and beauty salon are all here. Transportation: Our private tram will take you up and down from the hotel to the beach. Come to the Cape Panwa Hotel and let us really welcome you to Phuket.